The next-generation series of Tracking and Data Relay Satellites (TDRS) provides NASA with crucial crosslink communications capability between Earth-orbiting spacecraft and control and data processing facilities on the ground. With the landing of the Mars Science Laboratory (MSL) on Mars, on 6 August 2012, it is appropriate to have a look at previous U.S. missions to Mars. Mars is relatively easy to study as it is close to the Earth and has no clouds which obscure its surface. Its generally red appearance led it to being associated with war and when its two tiny moons were discovered they were named Phobos (fear) and Deimos (terror). Mars is also of interest as it is possibly the only other planet in the solar system that may, once, have harboured forms of life. Andrew Matlock has a work history that spans 25 years across the telecommunications and technology sectors. He has worked as Regional Manager for Calcomp Inc, (a division of Lockheed Martin), was CEO and co-founder of Inspar Pty Ltd and co-founded successful start-up ventures in the United States of America and in Australia. Approximately 18 months ago, I had the opportunity to work a research project that looked at cellular and WiFi connectivity onboard commercial aircraft. With a number of solutions available to allow connectivity in the skies, many airlines were understandably confused as to which of these they should adopt in the future, especially given the unmitigated disaster that was Connexion by Boeing. Retrofitting just one aircraft with the necessary equipment to enable passengers to wirelessly connect to the Internet is very costly and it is therefore imperative that the right decision is madeeven more so in these austere times. Suomi NPP is building a bridge to a new era of Earth Observations (EO). Understanding, monitoring and predicting the course of long-term climate change and short-term weather fluctuations remain tasks of profound importance. Economic competitiveness, human health and welfare, and global security all depend in part on our ability to understand and adapt to environmental changes. SatBroadcasting Viable Solutions For E-Learning, The Internet has changed the e-Learning paradigm by introducing interactivity and multiple communication threads. The challenge is that delivery of video content to the classroom, or to video distribution to customers, is usually done with platforms that are based on broadcasts over the air that do not allow for interactivity. 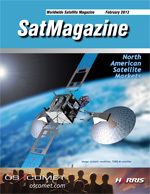 The trade-offs of low cost satellite DTH systems such as these is a lack of bi-directional functionality that is required for modern, distance-learning interaction, newsgathering activities, and content distribution networks. What Is A GPS Simulator?, Developers and manufacturers need better ways to guarantee GPS receiver performance. As GPS receivers are built into more mission-critical devices for difficult application environments, and designed with the emerging capabilities of a multitude of GNSS constellations and augmentation systems, developers and manufacturers need better ways to guarantee performance. Thats where a GPS simulator comes in. Gottlieb International Group reports that Inmarsats Fleet Broadband and E & E prices are going up again.